Who can contain the beauty of nature in a single image? Nature is all around us and its beauty is present in all the environments of the Earth. The Vickery job is no exception. It naturally draws out a wide array of colors from the Scabos Travertine Pavers and vibrant blue waters of this free-form pool design. This swimming pool is riveting and fills the eyes with so many colors and hues that it takes a while to process. 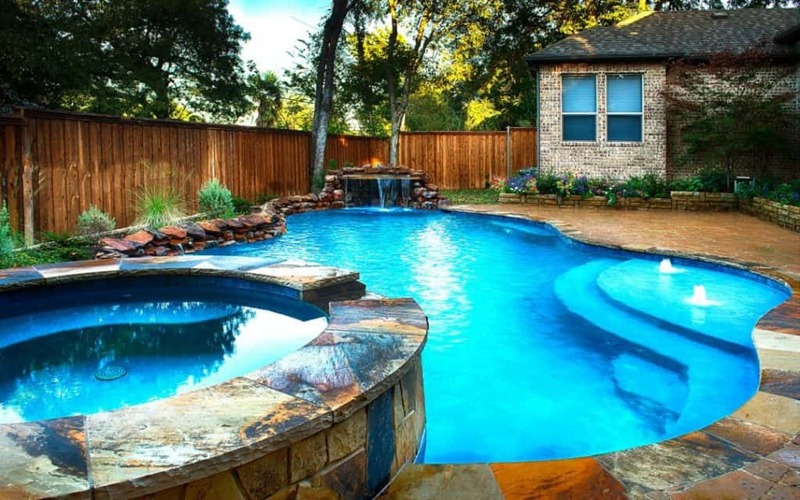 As we covered in previous articles, we believe that every backyard possesses its own natural beauty and we at Summerhill Pools love to bring it out. We assessed this backyard during our design phase and determined that natural was the way to go! 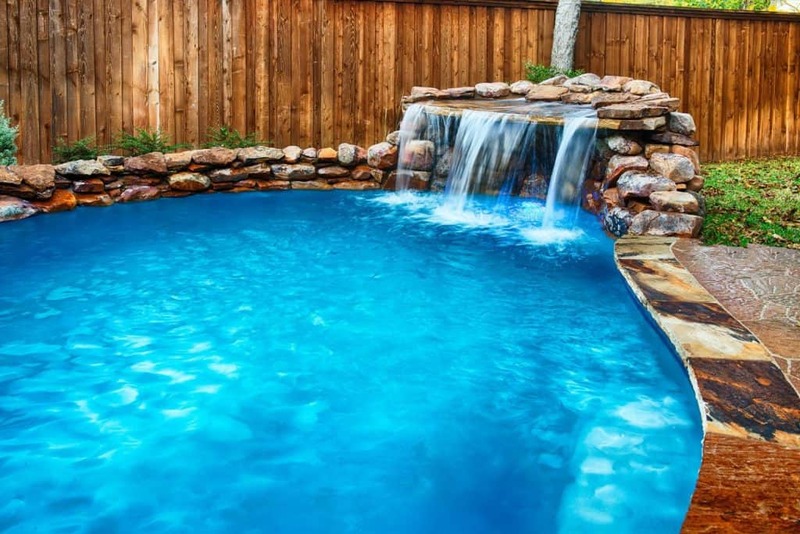 Just look at the natural flow of stone and brick from house to pool. This image shows the Vickery job from the end of the raised grotto waterfall. You can see its freeform design, curved scabos travertine and natural stone along the raised weeping wall (located on right). Such a gorgeous view! Just look at the vibrant colors of these scabos natural travertine pavers. The colors really provide a generous pop and accentuate the entire backyard to increase its natural vibrancy! By sealing the natural stone you can also create a natural wet look that makes these stones impervious to water and preserve them for many years to come! In order to make this backyard look as natural as possible, we stuck with a Freeform Design. This gives the backyard a lagoon-like feeling and presents an oasis to escape from the simmering summer heat. It may appear simple to create a freeform layout, but we assure you it is not. The natural travertine coping sections that form our perimeter naturally come in 12″x24″ straight sections. Our incredible mason had to cut each piece of coping to form the smooth lines around the pool and spa. Once each piece is cut and laid, they must be chiseled to create the tough edging (as seen on the outer perimeter of the spa). This is a complex process and is generally costly and time-consuming. The various elevations are plain to see but blend easily into the surrounding landscape. It’s a common-sense approach but difficult to pull off in actual execution. These colors & materials blend nicely to create an environment that resembles more of an oasis or lagoon than an actual backyard. To complement our look even further, we added in raised sections for the spa, weeping wall & grotto waterfall. Most attached spas are raised to create an overflow into the pool when ran on spa mode. For those tech lovers out there, our pool automation systems give us complete control over the programming. This allows us to activate various flow features and multiple effects. The weeping wall is an interesting component of this swimming pool. The back wall (located next to the fence line) provides a unique space for our landscaping. It is also plumbed with 3/4″ PVC and multiple points of entry into the swimming pool area. This creates a large, curved and fully custom water feature for any time of day. It’s also extremely relaxing to listen to when escaping from the haste of daily life. Lastly, the raised grotto waterfall is a fun feature for the kids. The ledge extends over the surface of the water to create a rainfall effect and the swimmer can rest beneath the falls for a little privacy. Grotto by definition is a cave or dwelling place created by exposed rocks and waterfalls. We brought that definition to life in a small way for the Vickery Job. Wow, check out that waterfall! This grotto is plumbed with a separate water feature pump to ensure correct filtration for both pool circulation and visual effects. Often times a secondary pump is required to outfit a water feature of this size. The reason being, your pool needs to complete a 100% turnover of water within its required 8-hour period. Using a secondary pump reduces electrical output because it allows for increase water flow with less energy required to clean and operate both systems. “Would you like a little bubbly with that drink sir?” In the case of Vickery, we provide the bubblers in our custom curved splash pad. This pad also serves as a large entry area – perfect for relaxing and entering/exiting the swimming pool. It’s also a perfect area for small kids and pets to play safely and within reach of mom and dad! Definitely a nice touch! These bubblers are activated by the Automation System that is controlled by a Smart Phone: Android or iPhone compatible. These bubblers are also upgradeable to a LED lit option as well – perfect for entertaining large parties! Scabos Travertine is used to cover both the raised wall sections and double-sided coping along this raised spa. The look is unique and artistic. Simple and complex at the same time. We are proud to offer these designs to all of our Summerhill Pools customers and always ready and willing to be creating and generate a look that is unique to you and your home! If you like the look of this pool and are interested in what Summerhill Pools can do for you, we invite you to give us a call! We also have lots of other work for you to read and review. Check out our other articles listed below for further ideas and inspiration!